Do you wish to make your own inexpensive gift for special occasions? Do you love to relax in a spa-like room or bathroom? The luscious scents of sandalwood vanilla candle complemented with the warm sensation of its flickering light can easily bring your senses to halt. Candles made from essential oils are definitely worth the trouble as they can easily help you de-stress and relax. Apart from that, knowing how to make aromatic candles will definitely earn you plus points during special occasions. So, whether to de-stress or to make thoughtful gifts, it is only fitting that you know how to craft your own brand of aromatic sensation. Of all the essential oils available, however, you might be wondering why sandalwood and vanilla? The truth of the matter is that you can basically pair any essential oil so long as the base oil is sandalwood. Here, vanilla is chosen to complement the overpowering senses of the sandalwood with its soothing scent. The effect—and astounding sensation to the olfactories! Sandalwood is basically used in many aromatherapy items, soaps, perfumes, aftershaves, beard gels, and many more. It lends a sweet and woodsy smell lending a sense of energy. When used alone, it can be overpowering and overly ecstatic defeating the candle-making purpose. This is where the ageless scent of vanilla comes in. A known aphrodisiac, it is coated with the undertones of mystery and depth. When combined, both essential oils gloriously deliver aromatherapy experience so relaxing you wish it never ends. Now, the challenge is how to create a perfect dilution that will enamor your senses. 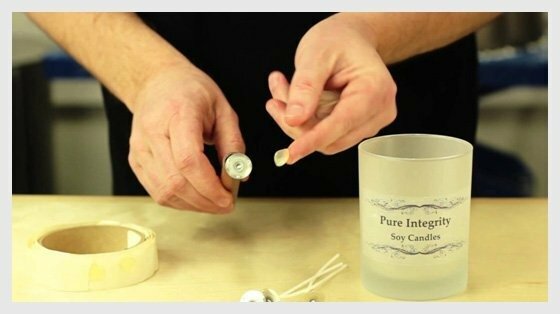 Prepare by placing a small amount of glue (or double-sided tape) on the wick’s bottom. This will help keep it erect in the mold’s or the jar’s bottom later on. Be reminded that the more centered a wick is, the better is the burning quality of the candle. To keep the wick upright and centered all the time, make sure to tie a knitting needle on its free end. Let it rest on the sides of the mold. Place a cup of water on the double boiler’s bottom portion. Bring it to a simmer and then, place the beeswax (or soy wax) unto the top. Do monitor the wax’s temperature by inserting a candy thermometer. Make sure that the wax reaches 145 to 175 deg F before stirring it with a wooden spoon or spatula as it melts. Now, place the sandalwood and vanilla oil into the melted beeswax. Stir carefully to ensure complete mixture. Carefully remove the aromatic melted wax from the double boiler and slowly pour it into the mold or jar. Let the beeswax + essential oil combo to cool at room temperature allowing it to naturally harden. Once hard, remove it from the mold and clean up uneven edges using a razor blade. If you are using a jar, clean the lid thoroughly of any messed up wax during the pouring session. Cut the wick using a scissor. Leave at least a quarter-inch length for slow burning. Now, light it up and feel the sensation! Or add some personalization by donning some designs learned from your arts and crafts class and your friend will be in for a big surprise. There is nothing more exciting than learning to make your own sandalwood vanilla candle. Fun, simple and easy, you can easily develop this as a hobby particularly during gift-giving times like Christmas, birthdays, and family reunions. With such therapeutic sensations, you can finally enjoy a scent that’s tailored just for you. Would you like to make your own sandalwood vanilla candle? Here’s how.